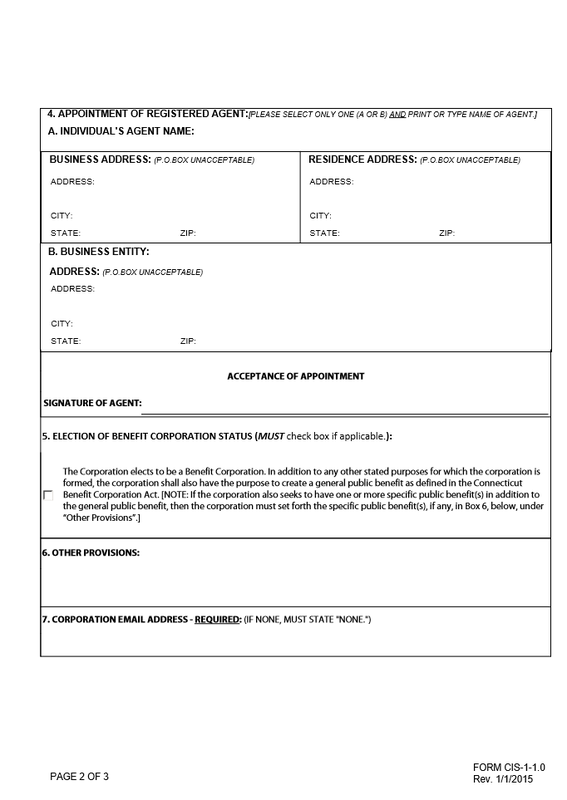 The Connecticut Certificate of Incorporation Stock Corporation may be filed with the Connecticut Secretary of State by mail or in person. This is a required filing for any business entity wishing to operate and conduct business as a stock corporation in the State of Connecticut. While this does not constitute all the paperwork that must be submitted to all interested and governing entities, it does satisfy the most basic filing for a Certificate of Incorporation. Incorporators are strongly encouraged to seek legal consultation to make sure they are fully abreast of their responsibilities in creating a stock corporation both on the state and federal levels. 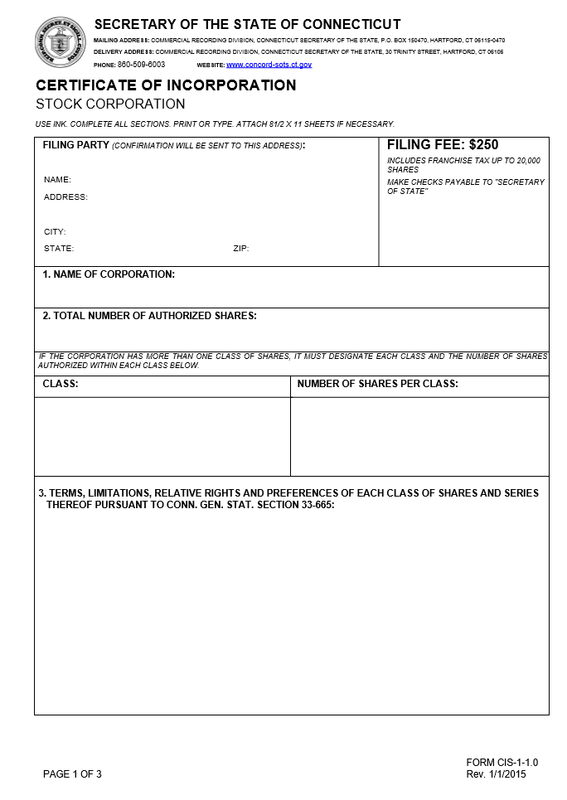 When filing these articles, you should make sure you have organized all attachments and required documentation properly, completed the original article to submit, and supply full payment for the state filing fee ($250.00). Make sure all checks are payable to “Office of the Secretary of State.” Filings may be sent to: Commercial Recording Division, Connecticut Secretary of the State, P.O. Box 150470, Hartford, CT 06115-0470 or you may hand deliver the articles to Commercial Recording Division, Connecticut Secretary of State, 30 Trinity Street, Hartford, CT 06106. Step 1 - The individual physically submitting these articles will be considered the “Filing Party.” In this section (Filing Party), enter the full Name, Address, City, State, and Zip Code of the filing party. Note: The Connecticut Secretary of State will send correspondence regarding this filing to the individual listed here. Step 2 - In Item 1, “Name of Corporation,” report the full name of the corporation being created by these articles. This should be a unique name and must contain one of the following phrases: Corporation, Corp., Incorporated, Inc., Company, Co., Societa per Azioni, S.p.A., Limited, or Ltd. Step 4 - In the section “Terms, Limitations, Relative Rights and Preferences of Each Class of Shares and Series Thereof Pursuant to Conn. Gen. Stat. Section 33-665″ section you must divulge specific information about each class of stock, including such facts as how much of each authorized class exists, each series, the par value of each, rights, and limitations. You must be fully compliant with Section 33-665.If there is not enough room to present all the information on these articles prior to issuance then attach a separate document fulfilling the requirements stated in Connecticut General Statutes Section 33-665. Step 6 - If the corporation being created intends to achieve and maintain Benefit Corporation Status, check the Box in Item 5, “Election of Benefit Corporation.” Also, if checking this box and the corporation will have a specific public benefit purpose(s), then you must list the specific purpose(s) in Item 6 (“Other Provisions”) If not, then do not fill in this box. Step 7 - Item 6, or “Other Provisions,” gives the opportunity to report any additional provisions not directly named on this form but must be present when the articles are filed. This will also give the opportunity to report the specific public benefit(s) this corporation may wish to assume if it seeks the Benefit Corporation Status and has one or more specific public benefits rather then providing general public benefits. Step 8 - The Connecticut Secretary of State, by default, will respond to this filing by email. In Item 7, report the email address where such correspondence will be received. If no such email address exists then enter the word “None.” (It is highly recommended to have and provide an email address where the Connecticut Secretary of State may send confirmations, notices, and other information). 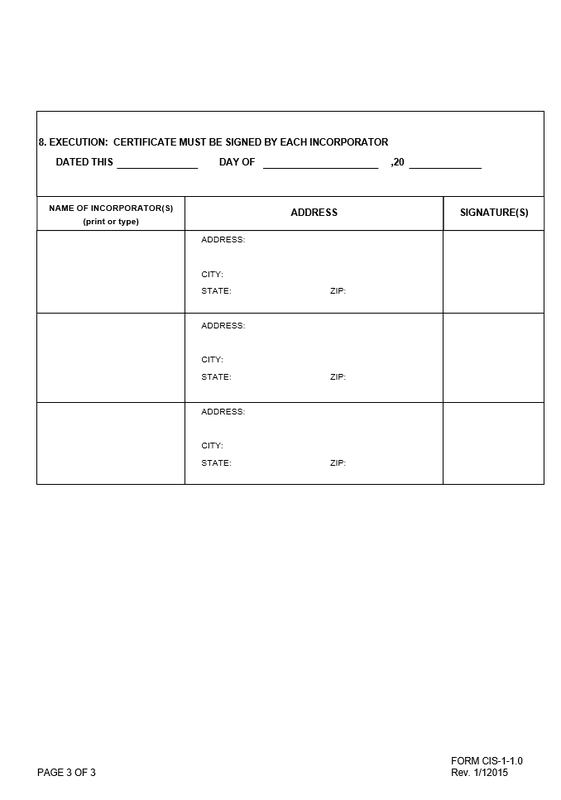 Step 9 - In Section 8, “Execution: Certificate Must Be Signed By Each Incorporator,” provide the Calendar Day, Month, an Year, this form is being executed. Below this, each Incorporator must print his/her name, provide his/her address, and sign his or her name under the headings “Name of Incorporators,” “Address,” and “Signature(s),” respectively. Each Incorporator should have his/her own row. 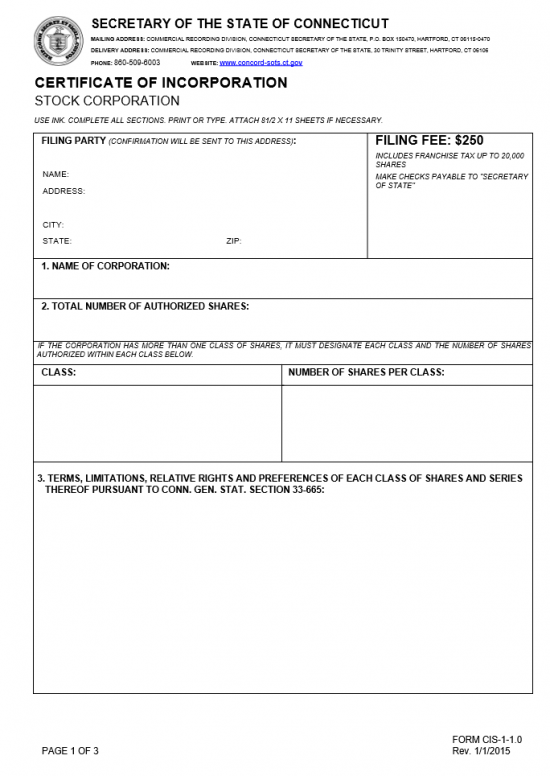 Step 10 – You must submit the original and completed articles, any necessary attachments, all required documents and the full payment for the $250.00 filing fee to the Connecticut Secretary of State. All checks must be made payable to “Office of the Connecticut Secretary of State. You may submit this package by mail or hand deliver it. Once these articles have been accepted the Connecticut Secretary of State will email a confirmation.